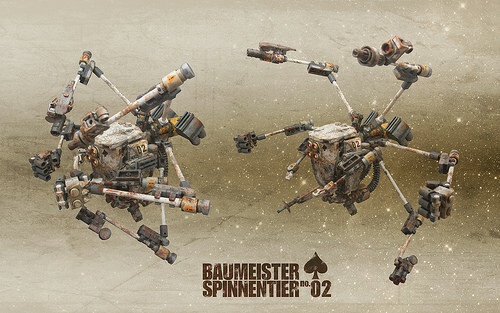 One of the more notable Maschin Krieger inspired builds from this year’s Ma.Ktober fest is probably the Baumeister Spinnentier, a “construction arachnid” style zero-G hardsuit, created by Canadian builder Josh Derksen. Clearly the break-out technique Josh has used here is the application of paint to give the model a rusted look (…yes it rains in space, deal with it!). Using paint to artificially ‘weather’ LEGO is something I’ve wanted to do myself for a long time, but have not yet been man enough to attempt. But Josh totally nails it with this creation. Check out his full breakdown to get a look at all of its finer details and play features (which include poseable arms and pincers, and an openable cockpit). Heh, I spent months trying to get a bulk order of lego to NOT look like that. Rust included! I’ve actually saved the worst of them in case I ever need them for a rusted heap MOC.